Facebook has launched a concerted PR effort to bolster opinion of its ad products and marketing effectiveness, releasing research on the performance of its solutions for businesses. But while the research shows positive results for marketing activity including Pages and its ad products, the amount of data released has been limited and mostly related to a few select brands. Accused of cherry-picking evidence of its effectiveness in the past, the real story could be less positive than Facebook’s analytics show, according to comments from a local Facebook adman. Last week, the newly public company’s PR agency contacted Marketing with the findings and an offer to interview a spokesperson based in their Californian headquarters about a report conducted using comScore social media analytics, and its own research into return on investment. comScore’s report demonstrates how different steps in the social media marketing process work, evaluating the combined impact of owned (a brand’s Facebook Page), earned (amplification of a brand’s content from fans to friends of fans) and paid (ad placements in the right hand column of Facebook’s layout) techniques. The report, dubbed ‘The Power of Like 2′ calls the three techniques, when used together, “a virtuous cycle of brand impact”. 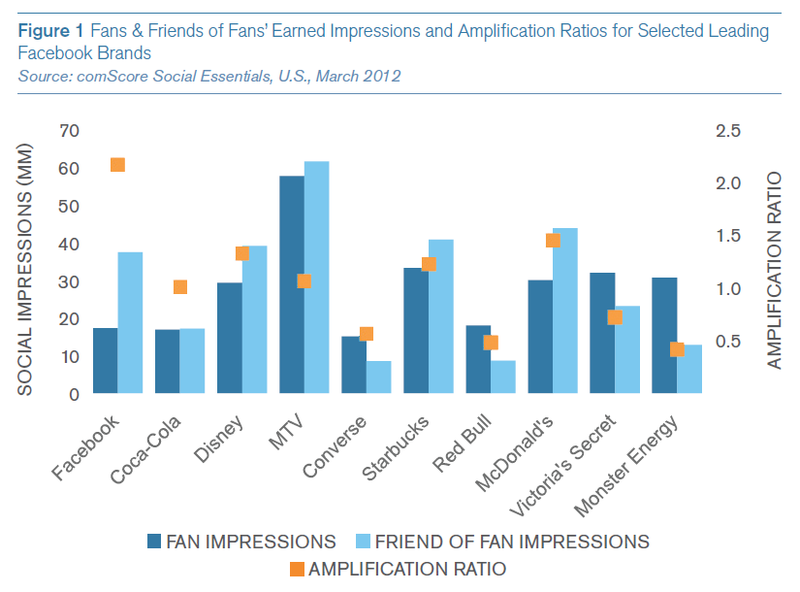 To illustrate rates of amplification, comScore looked at the “leading brands on Facebook”, reporting that most achieve a monthly amplification, or earned media exposure to friends of their fans, of between 50 to 200%, expressed as a ratio of 0.5 to 2.0. This amplification was driven by optimising fan reach and engagement and by supplementing with paid advertising strategies, which for the top ten brands, shown below, resulted in an average amplification ratio average of 1.05. 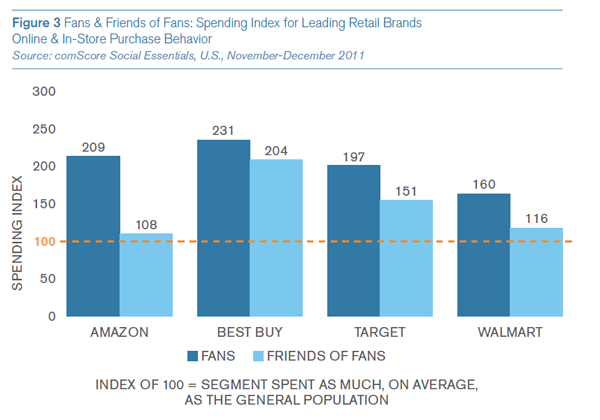 The report then goes on to look at how Facebook campaigns impact on sales, using an analysis from the American 2011 holiday season examining the social media presence of four leading retailers: Amazon, BestBuy, Target and Walmart. During this period “most of these retailers were highly active with their social marketing programs on Facebook, in some cases soliciting customers and potential customers to become a Fan in order to get a sneak peak at their Black Friday ‘door-buster’ deals,” the report reads. Amplification rates rose by two to four times what they normally were as a result of this activity, and resulted in higher spend levels for fans and friends of fans, compared to the general public, according to an index where a score of 100 represents what a member of the general public spent. 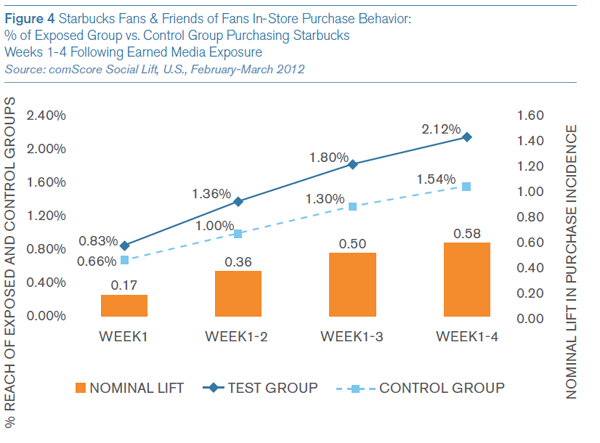 Starbucks was also used as an example, with a control group and test group compared over a four week exposure period, showing a 38% lift in purchase incidence among the exposed group. Facebook’s own research into ROI, which was conducted across more than 60 brands, claims a return on investment per advertising dollar of three-fold for most campaigns, and for some a return of five-fold. For “campaigns using a variety of third party methodologies like panels and mix media models, all client initiated, we have seen that, in all the studies run on ROI to date – not cherrypicked – all of the studies we have run” a return on ad spend of three times or better in 70% of cases and a return of five times or better in 49% of cases. With highly publicised cases of big brands pulling out of advertising on Facebook, such as General Motors, and criticism over their ad formats, the newly public company is under increasing pressure to display a stronger monetisation strategy. Ben Willee, general manager and media director of STW Group’s Spinach Advertising, which runs Facebook campaigns for a number of local clients, agrees with criticisms of the social networks ad approach. “The Interactive Advertising Bureau has a number of standard formats that have been developed over the last ten years to suit advertisers and to suit the industry and Facebook doesn’t operate in that space,” Willee says.